Place grass seed in the toe of the stocking. Fill the foot of the stocking with sawdust or peat moss. Add just enough to make a nice round ‘head’. Make sure you don’t mix the grass seed into the stocking too much. Tie a knot in the stocking right above the level of sawdust/peat moss. You may have to squeeze the material down to make a tight round ball. Soak your grass head in a bowl of water until it gets wet (you’ll know as it will get heavier). Once it is a bit wet, place the head on a saucer so it doesn’t drip everywhere. 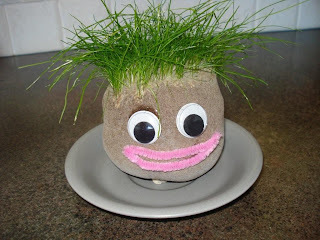 Once the head is dried out (about a day) you can give your grass head a face with markers. If you have wiggly eyes you can glue them on. You can also glue yarn or pipe cleaners on the face to make ears, mouth, nose, etc. HINTS: Keep your grass head on a plate or saucer and in the sun, but don’t let him get too dry. To keep him damp, dip the top of his head (the toe of the stocking where the seeds are) in water every day. In about a week, hair (grass) should start sprouting. (Be patient!) Once it starts growing you can give him funky haircuts! Don’t forget to keep watering him! This activity promotes creativity (and delayed gratification).